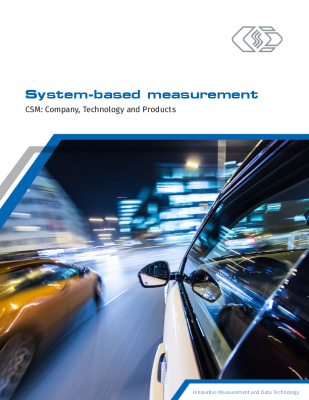 As an internationally leading manufacturer of distributed measurement technology, CSM is an innovative and reliable partner of major vehicle manufacturers, suppliers and service providers worldwide. Our customers for many years rely on our measurement modules and data loggers for the development of their vehicles and components. One of the core competencies of CSM are mobile, extremely compact and reliable measurement modules and data loggers. These are successfully used worldwide by renowned manufacturers of cars, trucks, special vehicles, tractors, construction machinery, rail vehicles, their suppliers and service providers. In addition, CSM manufactures and distributes storage media and drives for industrial applications. With our OmniDrive devices for PCs, we support an extremely wide range of memory cards. For users of older memory cards, we are thus able to provide a connection to the most recent operating systems. In the fields of programming tools, we focus on tools and devices for the programming and testing of control units. The source of our product quality is our high standard, implemented through our in-house development and production. At the headquarters in Filderstadt, CSM employs more than 90 people, most of them highly qualified engineers with a long-lasting experience in hard and software development. We also dispose over state-of the-art equipment, an own test laboratory for EMC tests, own production facilities as well as a calibration laboratory with DAkkS accreditation (D-K-15214-01-00). Products and support from CSM are available worldwide, centrally from Germany or locally through our subsidiary CSM Products, Inc. in the United States, our liaison office in France, as well as over carefully selected and trained distribution partners. With Vector Informatik as our main partner in Asia, we are intensively expanding our international sales structure for now.